Henk Swarttouw is currently serving as the Chairman of the Contact Group on Piracy off the Coast of Somalia. 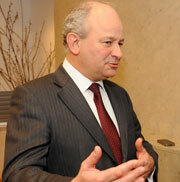 Until October 1, 2011 Mr. Swarttouw was Director for Security Policy at the Netherlands Ministry of Foreign Affairs. Mr. Swarttouw joined the Netherlands foreign service in 1989, and has served at the Dutch embassies in London, Paris, and Washington DC, as well as in various positions at the Ministry of Foreign Affairs in The Hague. In this interview, Mr. Swarttouw discussed the work of the Contact Group; the latest trends concerning piracy in the Indian Ocean; and the various measures the international community is taking to reign in this phenomenon. He also spoke about the domestic challenges Somalia faces and the extent to which the fight against al-Shabaab, including initiatives to provide economic development and rule of law, can be integrated with fighting piracy. Mr. Swarttouw acknowledged the importance of dealing with the root causes of piracy: “We are dealing with big international organized crime… the financiers, the organizers, the recruiters, the negotiators. Those are our next targets.” The root causes, however, also include poverty and the breakdown of governance in Somalia. “We have to help the regional communities, local communities, set up alternative livelihoods to wean them from piracy,” he said. The interview was conducted on November 17, 2011 by Warren Hoge, Senior Adviser for External Relations, International Peace Institute. Warren Hoge (WH): Henk Swarttouw, is chairman of the Contact Group on Piracy off the Coast of Somalia. Thank you, Mr. Swarttouw, for speaking with the Global Observatory today. Mr. Swarttouw, can you describe, in a few words, the mandate of this group, the scope of its work, and the impact it has had on the fight against piracy off the coast of Somalia? Henk Swarttouw (HS): I will be happy to, Mr. Hoge. Thank you for inviting me to speak to the Global Observatory. The Contact Group has existed for three years now, based on Security Council Resolution 1851, which asks states and organizations to get together to set up a mechanism to deal with the rising problem of piracy off the coast of Somalia. The mandate is annually renewed by the Security Council of the UN, but we work outside the UN. We consist of about sixty countries, twenty-plus organizations, as well as international organizations as well as private sector organizations, and we have divided our work in the number of working groups who deal with all the aspects of coordinating the fight against piracy: military issues, legal issues, public diplomacy issues, industry guidelines, catching not only the pirates but also investigating and prosecuting the networks behind them. Until now, in these past three years, we have produced a considerable body of work, and we are seeing the first results. WH: The European Union Naval Force has announced that this year 24 ships were hijacked in 134 piracy incidents off the Somali coast. This is a slight decrease from the previous year, but, obviously, these numbers are still very alarming. How is the threat of piracy evolving in this region? HS: I won’t bore you with loads of numbers and statistics. However, we do see a number of trends. The number of ships being held by the pirates is at its lowest point in two years. Same goes for the number of hostages being held by the pirates. There are about 240 now, which is still too many, but which is down from more than 700 two years ago. Those are positive trends. Another positive trend is a decrease in the success rate of piracy attacks. Over the past two years, the success rate of attacks has gone down from one in two to one in thirteen. However, there are also a number of negative trends. The number of attacks, the number of attempted attacks, is still rising. The violence being applied by the pirates is increasing. The treatment of the hostages is getting worse, and the ransom payments are also still rising. It is too early to say whether the glass is half full or half empty but it’s definitely half. WH: Groups like the European Union, NATO, and a growing number of individual countries have been contributing forces to fight piracy in Somalia. How is this collaboration working? What are the key challenges? And what role is the United Nations playing in coordinating these efforts? HS: As far as the military operations are concerned, military operations by the European Union, NATO, coalition maritime forces, but also what we call independent deployers such as China, India, and the Russian Federation, they are working together marvelously. We have limited naval assets in the region. Only very strong cooperation and coordination can make us deal with the problem in an efficient way. There is also very good contribution between states and the private sector. It’s the private sector who are the main victims of piracy. Through the IMO [International Maritime Organization] and other organizations, we have done a lot of work on enhancing the capabilities of the merchant ships to protect themselves, against piracy, and we work hand-in-hand. The same goes for a number of states in the region, who are, like the Seychelles and Kenya, very active in the prosecuting and incarcerating pirates. We don’t want to take all the pirates we catch to Europe to the United States. Trial in the region is the solution, and we work very closely together. The UN contribution is basically… there are two sides. One is, we deal with piracy, the larger problem of Somalia is dealt with by the UN through the UN Political Office for Somalia, chaired by Ambassador Mahiga of Tanzania, the Special Representative of the Secretary-General, and by parts of the UN system such as UNDP and UNODC, who deliver programs on the ground in Somalia in its regions and other countries in the region. We try to coordinate our work closely with the different parts of the UN system who are involved. HS: I cannot agree with that last comment by the International Chamber of Shipping, and it is perhaps even a bit disingenuous. We haven’t ceded control of the Indian Ocean to the pirates. However, the ocean between India and the African continent is a very, very big and empty area of sea, which is too large for our naval operations—even with increased assets—to patrol. There are pirate attacks going on in the area, just as there are burglaries going on in a big city. The police cannot control every street in every corner of New York City. The same goes for the Indian Ocean. So, we control the ocean, but there are those who slip through our nets. The other issue is that on land, Somalia is not under effective control, and that is where most of the piracy originates. Private armed security guards—the beginning of your question—are making a contribution to the reduction that I mentioned earlier in the success rate of piracy attacks. They deter attacks and they foil attacks. As such, they are a significant factor in the reduction of successful attacks. And they enhance other self-protection measures that ships can take on the basis of the so-called best management practices for the shipping industry that the contact group has developed. WH: It is often said that the fight against piracy can only be won on land. How can we remove the incentives to resort to piracy, and how can we combat international criminal support networks that fund and coordinate the pirate activity? Should such initiatives be coupled with economic and development assistance to build up alternative livelihoods? HS: You are absolutely correct. We are dealing with big international organized crime. There are networks ashore who support it, we catch the foot soldiers and we put them in jail whenever we can. But the big fish stay out of our reach. That’s why we have set up international investigation and judicial networks to map the information that we are gleaning from our investigations to target the people who are onshore. The financiers, the organizers, the recruiters, the negotiators. Those are our next targets. We have just set up the mechanisms to deal with this and we are hoping for good results. The second part of your question: indeed, you are absolutely right, the fight against piracy can only be won on land. And I don’t mean by military means, or boots on the ground. We have to provide economic development to the areas where the pirates originate. We have to help the regional communities, local communities, set up alternative livelihoods to wean them from piracy, and we are seeing encouraging developments by local communities who are fed up with the pirates, who’d chase them out of town covered in tar and feathers if they can, and it is very encouraging, and we need to support these people. WH: A big part of Somalia’s peril is the complete breakdown of governance and of the rule of law. Talking about this, it is impossible to leave out the role of al-Shabaab. Does the fight against al-Shabaab and the efforts to prop up the Somali state need to be better coordinated or integrated with efforts to fight piracy? HS: Indeed, we do need to order to coordinate, to integrate the fight against piracy, with helping the Somali government and the Somali regional governments to regain authority over their territory. There has been a lot of talk about the link between piracy and terrorism. Piracy and al-Shabaab, if you like. As some of the pirates—a minority, but still, some of the pirates—operate from al-Shabaab-controlled territory, we have to assume that some of the ransom payments to these pirates may end up in al-Shabaab coffers, be it as a security payments or whatever. However, we have not seen piracy being used structurally or consciously as a means to finance terrorism. The terrorists and pirates sometimes operate in the same geographical area, so we must assume that there are links between the two. However, we cannot equal piracy with financing terrorism. WH: Henk Swarttouw, Chairman of the Contact Group on Piracy off the Coast of Somalia, thank you very much. HS: You are welcome, it was a pleasure. Warren Hoge is Senior Adviser for External Relations at the International Peace Institute.